Petite Puf – Cotton Candy Cart Service from PetitePuf on Vimeo. For more information on our Event Services or Cotton Candy Keepsakes please visit our Services page or view our Frequently Asked Questions. To order our Cotton Candy Keepsake Jars please email us at hello@petitepuf.com or fill out our contact form. PetitePuf offers a full-service mobile Cotton Candy cart + event catering services that includes our PetitePuf Cotton Candy cart, our PetitePuf Cotton Candy machine, spinning artist, cones, and select décor (as agreed upon) depending on your event. How big is your cart and set up? Our PetitePuf Cart needs a 4’x6’ space for our Spinning Artist to operate in. Our boxwoods, optional balloons, machine, and cotton candy supplies will fit into this allocated space. For our larger packages with additional décor, we recommend setting aside an 8×8 space. As we are Vancouver’s only Organic MOBILE Cotton Candy Event Cart, we can set up and take down on-location quickly. We request access to an event site 30 minutes prior to the start of your event. Additional décor may require access 30-60 minutes prior to your event. Does PetitePuf require services on-site? Please ensure PetitePuf has access to power and elevator access to upper floors (event dependent). Will you work with my Event Planners or Wedding Vendors? Yes! PetitePuf is happy to work with your event planner, wedding planner, vendors, and location. Put us in touch with them and we will take it from there to make sure your event or day runs smoothly! 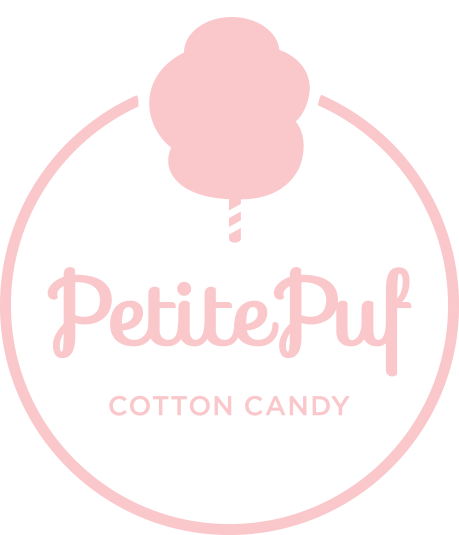 PetitePuf offers options to customize our cart, cotton candy colours, toppings, flavours, cotton candy cones, PetitePoppers, and our Keepsake Jars. Let us know your event theme or colours and budget we will personalize our services accordingly! We love getting creative and the sky is the limit with our customization so let’s play! We are currently booking throughout 2019! We recommend contacting us 3-4 months in advance of your event to secure your event date. Event dates are not guaranteed until receipt of your deposit. We look forward to your event!